I fished fri-mon of this week. Had to take off a day to go get the check to write for a 29 twin vee I am getting as a second boat. 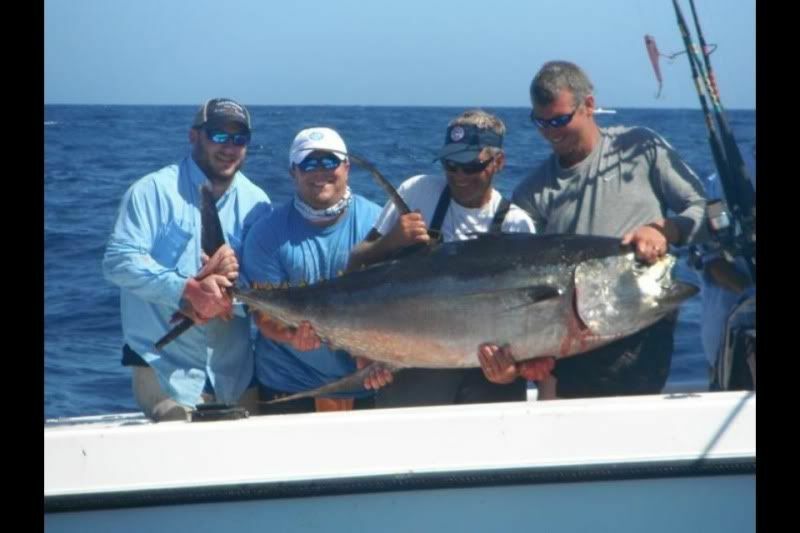 Fri-sat I had guys in from boston for some early season tuna fishing for them. Friday we had a great early topwater bite but we had problems making the connection for some reason. We put 4 in the boat on poppers and two on the troll. 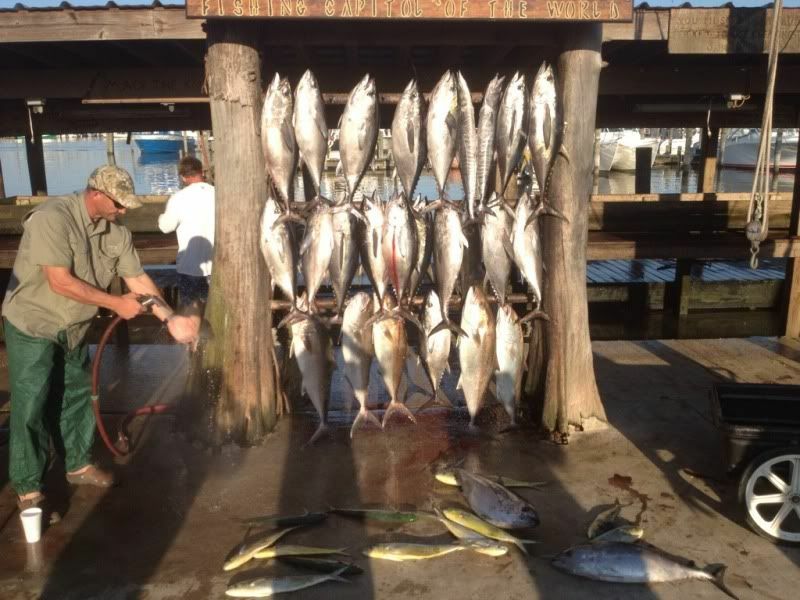 The great thing about it was all the fish were caught about 12 miles offshore. After we put six in the boat I started running farther to the east but I ran into a lightning storm that nixed that plan. I made a u turn and picked up some ajs on the way back to the dock before the bad stuff got worse.I had them for sat as well and the topwater bite was completely off. 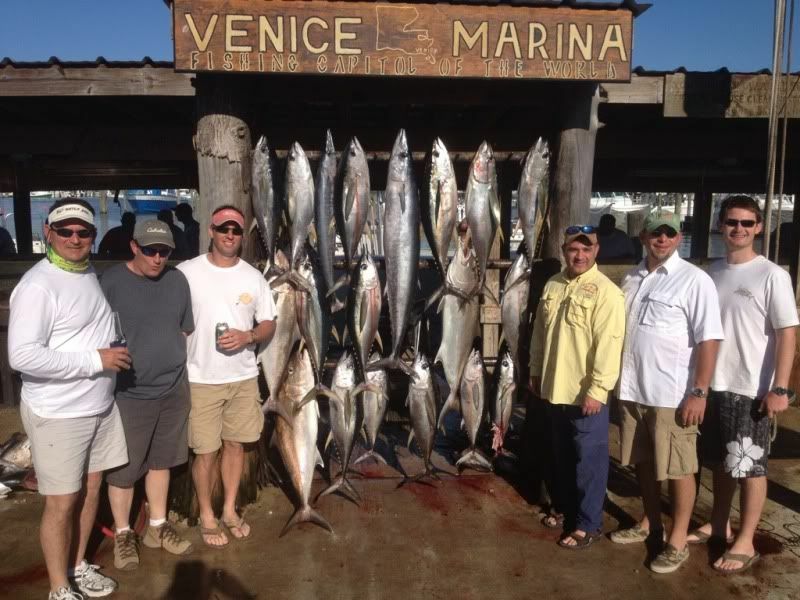 We did manage to pick up 7 yf and a wahoo on the troll though before it died off. 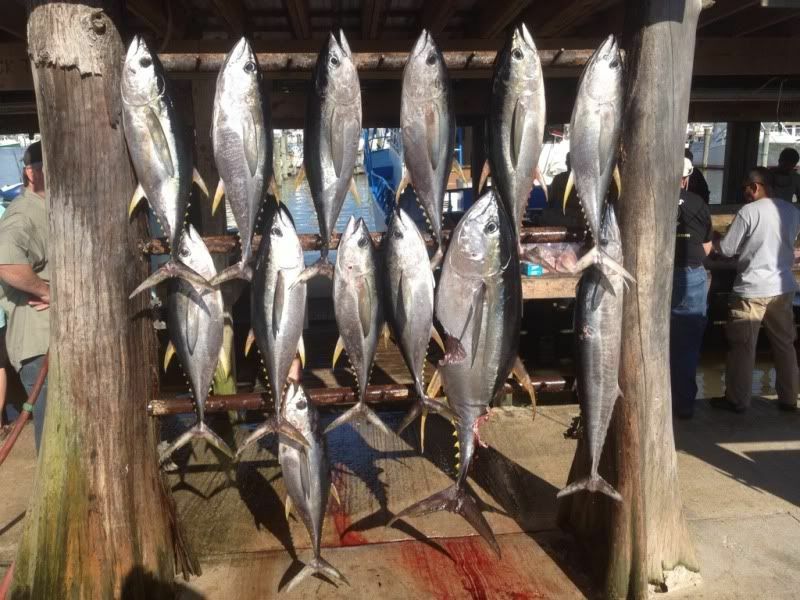 I rolled west today from there and at the next spot there were fish jumping but they wouldnt eat topwaters or trolling baits so out went the chunks and we immediatly doubled up on schoolie yf. Next drift we hooked a screamer and we could tell it was a good fish but it was acting wierd. We pulled it in with the sharks chewing on his tail and belly. I think it was all silkys eating it but it had some good teeth marks taken out of a 70-80 pound yf. We went looking for more wahoo but none were to be found. 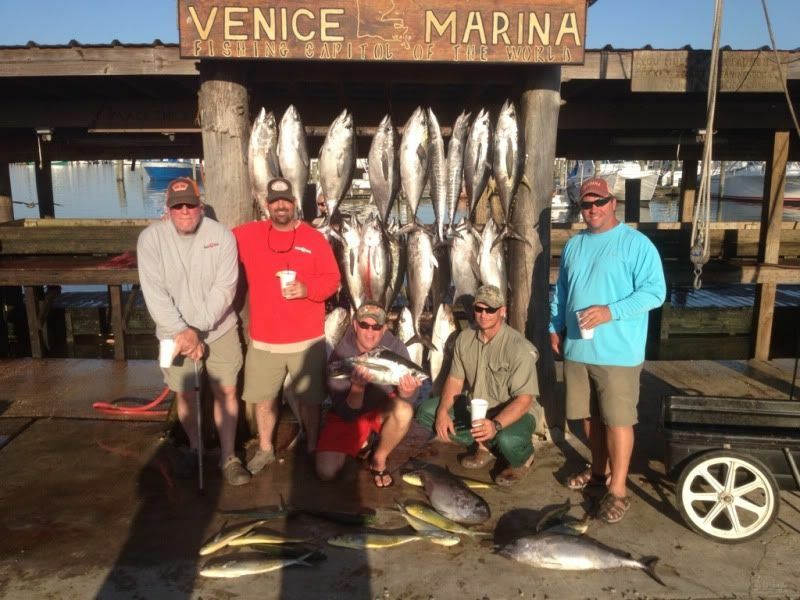 Sunday I had some guys in from texas and I went straight to our second spot from the day before and there was a little troll bite in the morning and we got a couple yf and a wahoo in the boat. At that point we started chunking and the guys were blind casting poppers on the front. We picked away with 3-4 fish on the chunk and the rest on poppers to end up with 11 yf on the day. 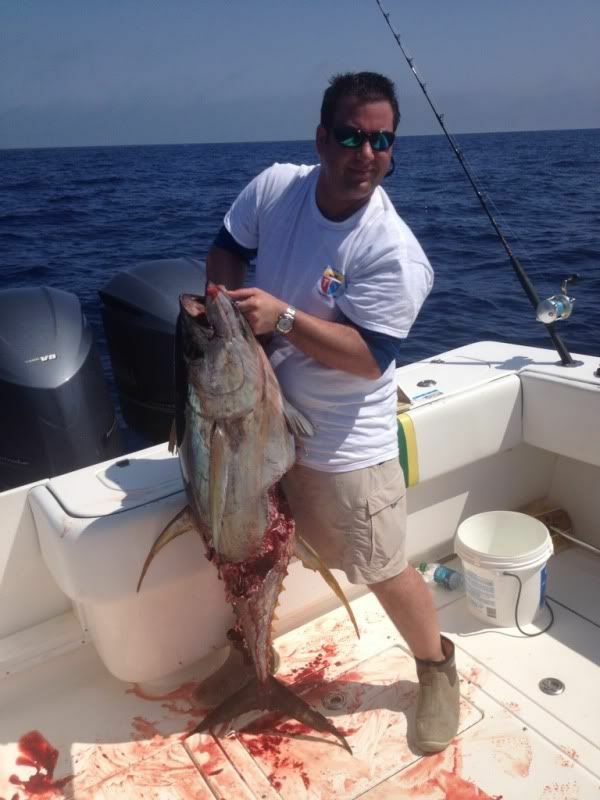 The catch of the day was definitly the 50 pound wahoo that bit a chunk and was caught on 60 pound flouro. Monday I had another group in from texas and we hit the shrimpboats first and caught 15 blackfin and one small yf in about 1 hour. At that point I went way south looking for yf and found a few busting but no fish biting. saw chicken dolphin everywhere so summer is on the way. I made a 30 minute move to another floater and found some more active fish as we got one on the popper almost instantly. We set up chunk lines while we were throwing poppers and had a few sharks issues but we pulled out three on the chunk and another one on the popper. I was headed in to aj land when I passed a weed patch that donated two wahoo to my cause. Stopped off for some ajs and jigged up a limit of 25 pound jacks fairly quickly before we headed to the house. All chunking fish were caught on 60 pound flouro with 6/0 circle hooks while the trolling fish mostly bit pink mirrolures and my popper fish came on frenzy poppers.